If you like this free game, try Super Toy Cars. Ever wanted to race a monster truck across the desert? Now's your chance! 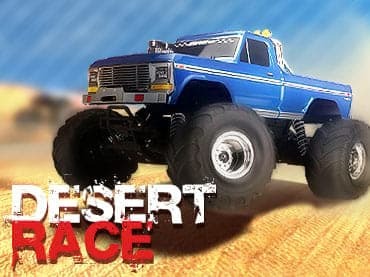 Desert Race is an exciting and fast-paced adventure racing game that pits you against a team of trucks scrambling for first place. Burn rubber across a huge variety of courses as you search for shortcuts and edge out the competition by any means necessary! As you unlock new tracks in Desert Race's unique story mode, you'll earn points for placing high enough in the rankings. Use those points to buy all-new gear for your truck in the mechanic shop. Want better handling? Faster top speed? Superior acceleration? No problem! You can even customize your color scheme to create the ultimate desert racing machine! - Tons of tracks to unlock. If you have questions about Desert Race game, please contact us using this form.